Daniel T. Davis graduated from Longwood University with a B.A. in Public History in 2005. He worked for five years as a historian at Fredericksburg and Spotsylvania National Military Park and Appomattox Court House National Historic Site. He is the webmaster for Emerging Civil War. Dan currently resides in Fredericksburg, VA with his wife and their beagle mix, Bayla. “Lost Battlefield: The Battlefield of Yellow Tavern.” Hallowed Ground. Fall 2016. 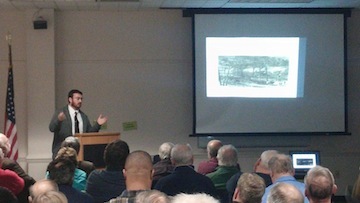 Just want to thank you again for your presentation, “Hurricane,” last night. You did one bang-up job. One the best this year (since March) thorough, yet leavin’ em wanting more a indicative of the Q/A that followed. If I or the organization may be of service to you in the future, please don’t hesitate ask.